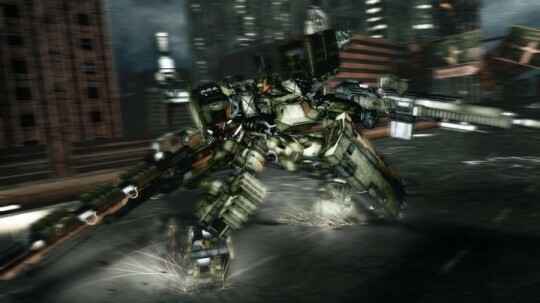 FROM Software and Famitsu have once again successfully hosted a live demonstration of the upcoming Armored Core V. The latest footage reveals more specific game mechanics and options. See the recorded video and a summary below. Jumping (and wall-jumping) requires energy. Overboost drained a reasonable amount. 3 to 4 successive quickboosts sent the demo AC into charging state. But unlike the PS1 and PS2 era games, only around 30% of the bar had to be recovered to become functional again. Regular boosting is still possible during the charging state. Reverse-joints are back, still with exceptional jumping abilities. Game data is now saved onto an online server to prevent cheating/hacking and sharing of saved games. Join the discussion at the Raven Republic forums for more info. This game is what I’ve been waiting for (and every Armored Core Fan in general has been waiting for!!!) plan to buy as soon as possible of course!!! looking like they want to unify fans of the Pre-AC4 and AC4 era. I’m disheartened only because I don’t see the demonstration of the decal system. I saw the demo live when it aired, but I don’t recall that. I can’t find it in this video. Why? Isn’t it there? Anyway, there really wasn’t much. They’re mostly using the same system from AC4, except that the Emblem Layer Count has now been increased from 16 to a whopping 128.
saved game data on an online server…figures FROM would eventually wise-up! Sigh, even with the gimped QB, I still don’t like it in general. I’m Sticking to my notion of it being a “get out of jail free card”. If ever i get this game, i’ll try not to map QB to any of the buttons.